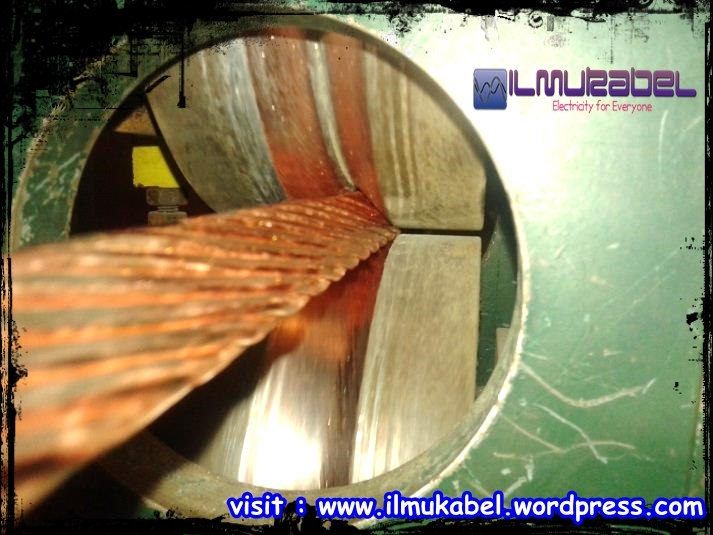 Milliken Conductor is one of the names or types of construction on High Voltage Cable ( HV ) and also on the Extra High Voltage Cable ( EHV ) . Voltage Range varies from 63-161 kV , 220-230 , 330-500 kV . 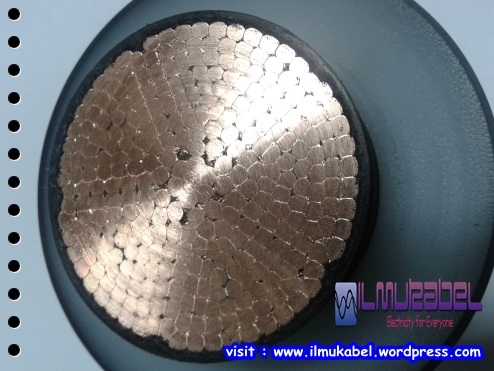 Milliken Conductor is used for large conductor cross-section , generally ranging from 1000, 1200, 1600, 2000 , 2500 , 3000 mm2 . For size underneath as 400 , 500 , 630 and 800 mm2 , simply use ordinary construction Circular Compacted Strand . The most important issue is why need to use Milliken construction is the ability to reduce the Skin Effect that commonly occur in large conductor size . Electric current that flows will be more concentrated on the area / boundaries / outer circumference of the conductor . 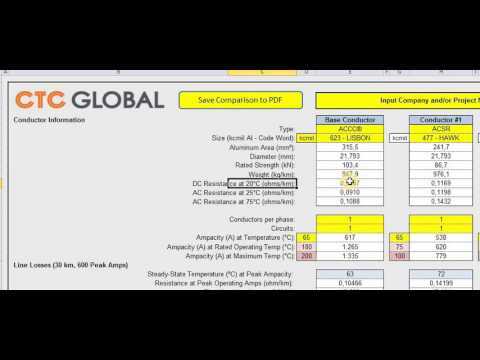 This will affect less well because the A.C. resistance of the conductor will be an increase. To reduce the influence of “Skin Effect”, the conductor can be devided into several segments. The number of segments ranging from 4, 5 and even up to 7 segment. Among the segment is separated with Semi Conductive or Insulation Tape. The shape of this sector was made in Rigid type stranding machine first, and then joined together (laying up) using Drum Twister machine. In the center of the conductor, we can add compacted strand core or solid copper, especially those consisting of 5 segments. Not all Cable Manufacturer capable of making. The level of difficulty is very high, the supporting material is not cheap, as well as some of the machinery and test equipment investment are fairly expensive. Each segment made in Rigid Stranding Machine . 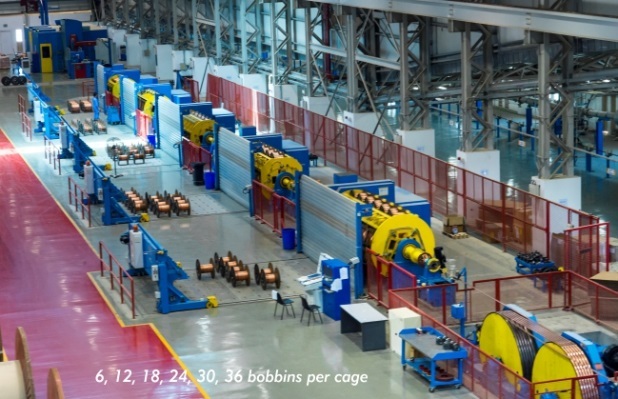 With a capacity of 54 wires (6 + 12 + 18 + 24) or 91 wires (6 + 12 + 18 + 24 + 30), to 126 wires (6 + 12 + 18 + 24 + 30 + 36), with 3-4 Cages or 5 cages at a time, (another term 6B + 12B + 18B…; B = show Bobbin / reel). 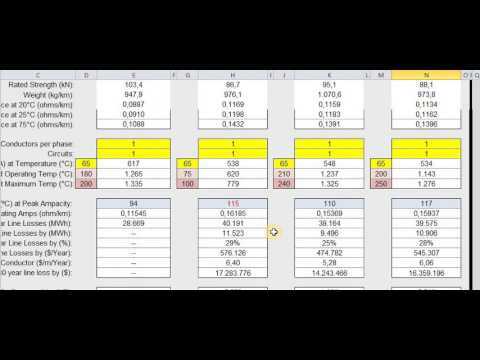 Cage rotation in RPM is not very fast, about 300 rpm, becouse the weight carried by the cages were very heavy, about 2 tons in 6B and 12 tons in the 36B. The cages rotation system, use transmission shaft and some machines use individual motors at each cage. Both function very well. Some Machine Manufacturer has proven its reliability, let say Stolberger (Germany), CORTINOVIS (Italy), POURTIER (France). Machine Life time can reach 10, 15, even 20 years. The China machines, Hefei Smarter, its life time of about 5-10 years. Economical life time at least should reach 5 years of operation. Pan Pioneer, Taiwan machine brand is also quite famous. This is where the rolls located. Can consist of 3-4 pieces of the partition, where each contains 2 pairs of upper and lower roll. 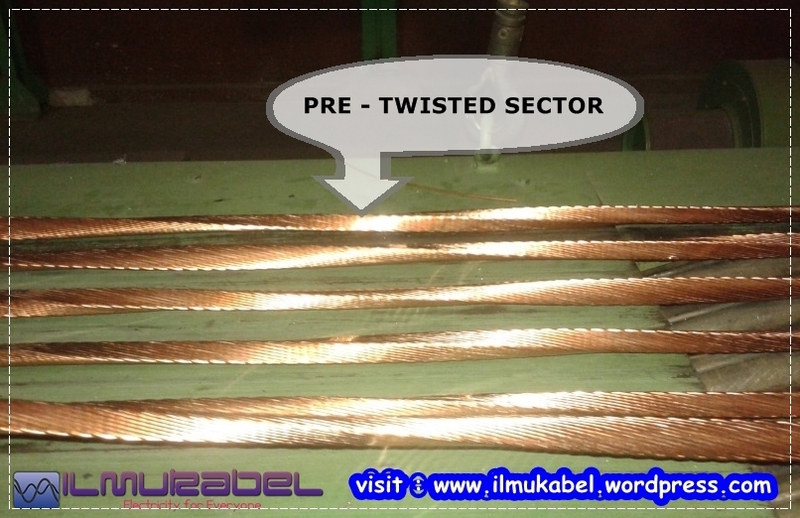 From the name “Pre-Spriralled” / PreTwist, then the task is twisted strand to form a spiral sector or torsion / lay separately in the sector length. Lay this length will be useful later in the process when penyatuannya Laying Up. When you will buy the machine Rigid Strand, would have offered this feature. If it does not intend to make Miliken conductor, simply select the features Straight Sector alone, the price of the engine can be cheaper. Compactor Prespiralled very vital role. Life and key to the success of making Miliken Conductor starts here. Type of transmission could use a motor (motorized system) and some are using Gear (Gearbox system). Current machines made in Europe many choose Motorized systems and machinery made in China prefer gearbox system (cheaper). For the lay length of flexibility or range of set-up and machine settings, Motorized system you can choose. But the heart – the heart, if there is an interruption in its electric synchronization, would be fatal to the outcome twist. While the system will not be impaired gearbox synchronization, but less flexible when set up and limited according to the table of existing gear. For compacting the perfect result, the unit is equipped with Compression Scale and Angle Scale + adjuster. 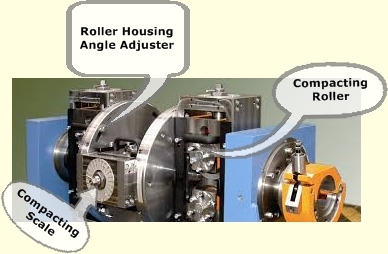 Serves as a form of sectors forming the upper and lower roller pairs. Angle and radius in desgin sector so that later on when 4 or 5 sectors / segments combined should sit perfectly, resulting in a certain degree of unanimity. If the design is not the right corner, there will be a gap / step and conductor did not look round. It will also affect the thickness innersemicond the extrusion process in CCV-Line. Design roller will also take into account the level of Compaction / compression. High population density (Filling Factor) makes the sector is resistant to deformation, not easily broken or “blooming” / Birdcaging. If the sector is easily broken or loose, then this would be a “nightmare” during the process of merger / laying up in Drum Twister. The diameter and number of wires must be designed to be able to produce good Compaction while maintaining a degree of flexibility conductor. Must be adjusted also with an engine capacity of existing stranding. General construction used can be numbered 1 + 6 + 12 + 18 + 24, 1 + 6 + 12 + 18 + 24 + 30 jobs. or modification of that amount, depending on the desired compression levels, target weight conductor, and so on. The higher the elongation of wire, it is increasingly easy to set up, as well as the flexibility a good conductor. 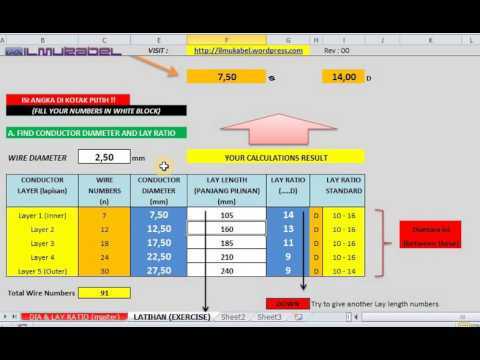 Drawing uniformity of elongation when the process also need to be considered. Wire tension or tension wire / brake (Bobbin Brake) when the stranding process is very useful to prevent sagging and broken conductor. Need to be checked and the calibration of the brake system before the process to ensure uniformity of its tension. 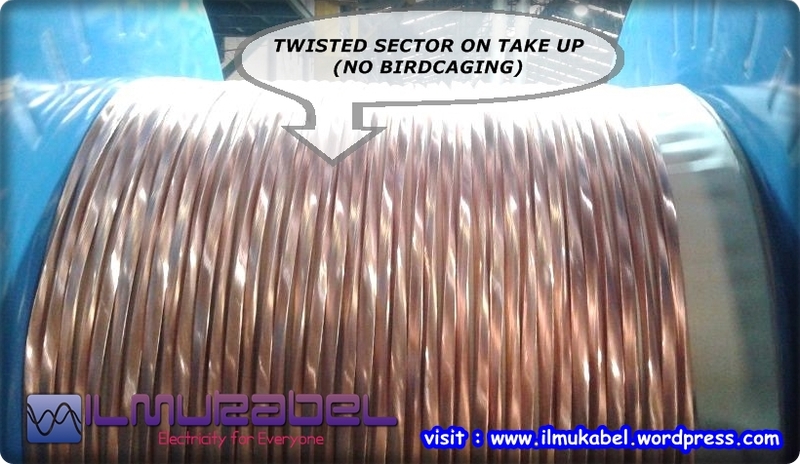 Long strands of wire (lay length) and direction of the torsion (lay direction) need to be considered to get a good sector shape, density and prevent birdcaging / bloom. Some disign encountered using the torsion UNILAY direction (unidirectional) or CROSSLAY (opposite direction). Both have advantages and disadvantages of each – each. 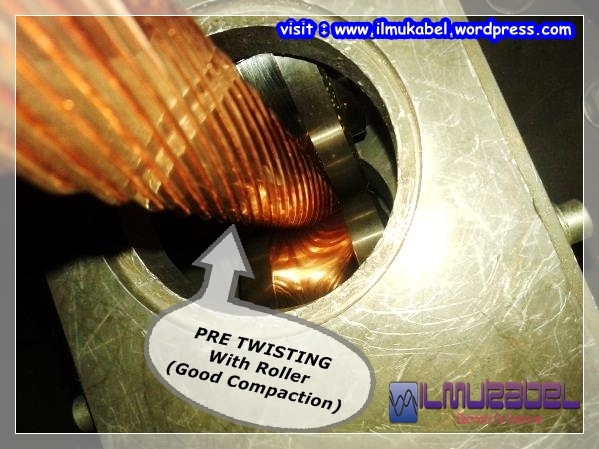 The length and direction torsion Pretwist sector is very important to note. This will be a significant impact to the success of the process Laying up and PRETWIST in CCV line. Measurement of resistance of the conductor (conductor resistance) is measured in a certain way, given the sector contained between the insulator layer in the form of waterblocking tape described above.